Figure A. Alexa Fluor700 conjugated mouse anti human CD14 (MCA596A700) and Alexa Fluor488 conjugated mouse IgG1 isotype control (MCA928A488). Figure B. Alexa Fluor700 conjugated mouse anti human CD14 (MCA596A700) and Alexa Fluor488 conjugated mouse anti human CD163 (MCA1853A488). All experiments performed on red cell lysed human blood gated on mononuclear cells in the presence of Human Seroblock (BUF070A). Data acquired on the ZE5™ cell analyzer. Figure A. RPE conjugated mouse anti CD14 (MCA596PE) and FITC conjugated mouse IgG1 isotype control (MCA928F). Figure B. RPE conjugated mouse anti CD14 (MCA596PE) and FITC conjugated mouse anti human CD163 (MCA1853F). All experiments performed on human peripheral blood mononuclear cells in the presence of Human SeroBlock (BUF070A). Figure A. Alexa Fluor700 conjugated mouse anti human CD14 (MCA596A700) and RPE conjugated mouse IgG1 isotype control (MCA928PE). Figure B. Alexa Fluor700 conjugated mouse anti human CD14 (MCA596A700) and RPE conjugated mouse anti human CD163 (MCA1853PE). All experiments performed on red cell lysed human blood gated on monocytes in the presence of Human Seroblock (BUF070A). Data acquired on the ZE5™ cell analyzer. Immunoperoxidase staining of a human tonsil cryosection with Mouse anti Human CD163 antibody, clone EDHu-1 (MCA1853) followed by the Histar detection system (STAR3000). Low power. Immunoperoxidase staining of a human tonsil cryosection with Mouse anti Human CD163 antibody, clone EDHu-1 (MCA1853) followed by the Histar detection system (STAR3000). Medium power. Immunoperoxidase staining of a human tonsil cryosection with Mouse anti Human CD163 antibody, clone EDHu-1 (MCA1853) followed by the Histar detection system (STAR3000). High power. Immunofluorescence staining of a human tonsil cryosection with Mouse anti Human CD163 antibody, clone EDHu-1 (MCA1853), red in A and Mouse anti Human CD21 antibody, clone LB21 (MCA1195), green in B. C is the merged image with nuclei counterstained blue using DAPI. Low power. Immunofluorescence staining of a human tonsil cryosection with Mouse anti Human CD163 antibody, clone EDHu-1 (MCA1853), red in A and Mouse anti Human CD21 antibody, clone LB21 (MCA1195), green in B. C is the merged image with nuclei counterstained blue using DAPI. Medium power. Immunofluorescence staining of a human tonsil cryosection with Mouse anti Human CD163 antibody, clone EDHu-1 (MCA1853), red in A and Mouse anti Human CD21 antibody, clone LB21 (MCA1195), green in B. C is the merged image with nuclei counterstained blue using DAPI. High power. Mouse anti Human CD163 antibody, clone EDHu-1 (MCA1853) used for the identification of infiltrating macrophages in the pulmonary tissues of cattle by immunohistochemistry on formalin fixed tissue sections. Immunohistochemical Labeling of Leukocytes in the Lungs. Shown are the results of IHC labeling for CD3-like immunoreactivity (CD3-li), CD163-li, IBA-1-li, and IL-17-li in the lung of uninfected control and representative infected Holstein calves. Note: CD3-li, CD163-li, and IL-17-li is significantly increased in the lungs of the infected calf. Furthermore, CD3+, CD163+, IBA-1+ and IL-17+ mononuclear cells are components of vasculitis lesions. Vascular endothelial cells consistently exhibit pronounced IL-17-li in the infected calf, but endothelial IL-17-li is rare in the control calf. Scale bar: 200 μm. East Coast Fever Caused by Theileria parva Is Characterized by Macrophage Activation Associated with Vasculitis and Respiratory Failure. Mouse anti Human CD163 antibody, clone EDHu-1 used for the identification of perivascular macrophages in human brain by immunofluorescence. Images demonstrating immunohistological stainings of amylin and double immunofluorescence staining against NG2/amylin, laminin/amylin and CD163/amylin in the hippocampus of the patient with AD and T2D. Amylin cell inclusions are indicated with arrows in (a) and shown in a higher magnification in (b). Pericytes with round cell bodies and NG2-positive coverage of the microvessel surface (green in c), without amylin cell inclusions (red in d), displayed round DAPI-positive cell nuclei (blue in e). The images in (c), (d) and (e) are merged in (f). Cells with more diffuse and weak NG2 staining (indicated by the arrowhead, green in g) and cytosolic amylin cell inclusions (red in h) showed altered cell nuclei (indicated with arrow, blue in i). The adjacent unaffected NG2-positive cell is indicated with an arrowhead in (i). The images in (g), (h) and (i) are merged in (j). Cells enclosed by laminin (green in K) contained amylin grains (red in l) and fragmented DAPI-positive cell nuclei (indicated with an arrow blue in m). The images in (k), (l) and (m) are merged in (n). 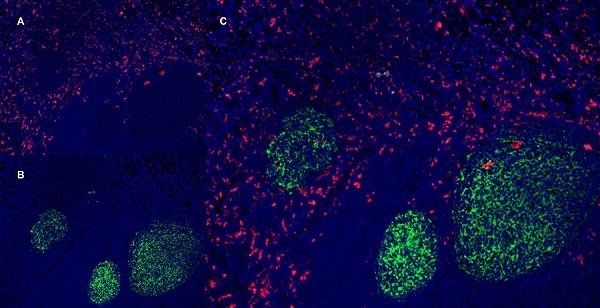 Loss of NG2 coverage (green in o) was associated with polarized amylin cell inclusion (red in p) and fragmented DAPI-positive cell nuclei (indicated with an arrow, blue in q). The images in (o), (p) and (q) are merged in (r). Staining against macrophage marker CD163 (green in s) did not co-localize with amylin cell inclusions (red in t). The cell nucleus was stained with DAPI (blue in U). The images in (s), (t) and (u) are merged in (v). Scale bars: (a) 50 μm, (b), (c) to (v) 5 μm. From: Schultz, N. et al. (2016). Amylin alters human brain pericyte viability and NG2 expression. 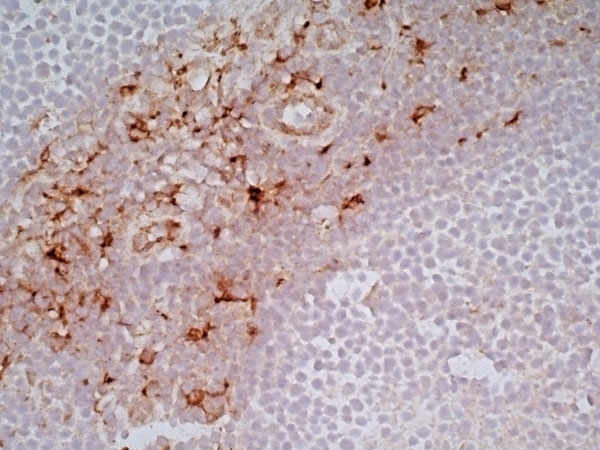 Mouse anti Human CD163 antibody, clone EDHu-1 used for demonstrating CD163 expression by anthracosis associated myeloid cells by immunohistochemistry. Myeloid Clusters Are Associated with a Pro-Metastatic Environment and Poor Prognosis in Smoking-Related Early Stage Non-Small Cell Lung Cancer. Mouse anti Human CD163 antibody, clone EDHu-1 (MCA1853) used for the evaluation of CD163 expression on porcine alveolar macrophages by flow cytometry. From: Seeboth J, Solinhac R, Oswald IP, Guzylack-Piriou L.
The fungal T-2 toxin alters the activation of primary macrophages induced by TLR-agonists resulting in a decrease of the inflammatory response in the pig. Vet Res. 2012 Apr 24;43:35. Mouse anti Human CD163 antibody (MCA1853) used for the evaluation of CD163 expression on microglia by immunohistochemistry on formalin fixed, paraffin embedded brain sections. Rasmussen's encephalitis. (A) Areas of active encephalitis and cortical scarring highlighted with increased numbers of HLADR-positive microglia/macrophages, as well as interstitial rod-like CD163-positive microglia cells (inset). (B) On adjacent sections, labelling with pS6 235/236 showed a similar distribution of cellular labelling as well as with pS6 240/244 (C). (D) pS6 240/244 highlighted many of the enlarged dysmorphic neurones in RE cases, as confirmed with co-labelling with neurofilaments (inset). (E) pS6 236/26 demonstrated labelling of smaller glial cells as well as (F) bipolar rod shape cells. Double labelling studies in RE cases confirmed the majority of pS6 labelled cells were not GFAP-positive astroglia (G) but co-labelled with populations of iba1-positive cells (microglial marker) (H), nestin and doublecortin (inset) (I) positive cells. Bar in A, B, C equivalent to approximately 100 microns, in d approximately 50 microns and E, F, G, H, I approximately 30 microns. From: Liu J, Reeves C, Michalak Z, Coppola A, Diehl B, Sisodiya SM, Thom M.
Evidence for mTOR pathway activation in a spectrum of epilepsy-associated pathologies. Acta Neuropathol Commun. 2014 Jul 8;2:71. 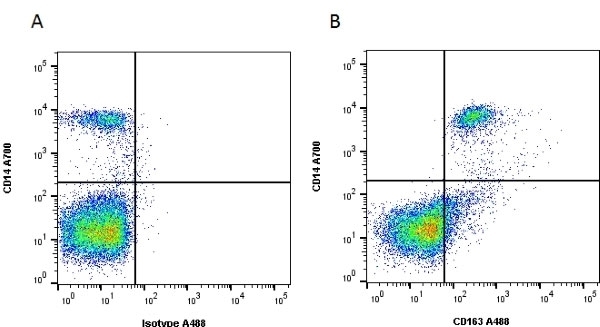 Mouse anti Human CD163 antibody, clone EDHu-1 (MCA1853) used for the demonstration of CD163 expression on liver macrophages from patients with primary sclerosing cholangitis by immunohistochemistry on formalin fixed OCT-embedded cryosections. T cells infiltrate PSC-patient livers. Representative immunostaining and quantification analysis of (A) CD3, (B) TCR-Vα7.2, (C) NKp46, (D) CD163, and (E) MHC class I expression in controls (n = 14–17) and PSC patients (n = 14–17). Samples were counterstained with hematoxylin and dark brown indicate immunoreaction product. Quantification was performed to calculate mean intensity of the stainings (ACIA) and frequency of expression (percentage of stained area out of total area). In Situ Characterization of Intrahepatic Non-Parenchymal Cells in PSC Reveals Phenotypic Patterns Associated with Disease Severity. PLoS ONE 9(8): e105375. Mouse anti Human CD163 antibody, clone EDHu-1 (MCA1853) used for the evaluation of perivascular macrophages on guinea pig myocardial tissue sections by immunofluorescence on formalin fixed, paraffin embedded tissue sections following heat mediated antigen retrieval in sodium citrate buffer pH 6.0. Immunofluorescence analysis of myocardial HO-1 and CD163 expression. Surgical non-treated (NT) control animals showed minimal HO-1 (green) expression in resident CD163+ perivascular macrophages (red) (A–C). Sporadic HO-1 expression (white arrow) localized to CD163+ cells observed with Hb alone (D–F). With LPS alone, CD163+ infiltrates and perivascular macrophages showed minimal HO-1 expression (white arrowhead) (G–I). Increased HO-1 expression localized to CD163+ infiltrates and perivascular macrophages observed with LPS + Hb (white arrows) (J–L,M–O). 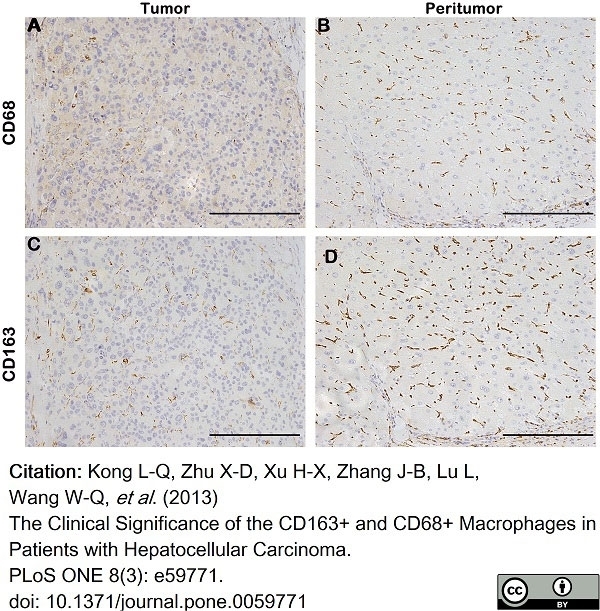 Hp reduces HO-1 expression in CD163+ infiltrates and perivascular cells (P–R,S–U). Nuclei were counterstained with Hoechst 33342 (blue). Scale bar = 10 μm. From: Baek JH, Zhang X, Williams MC, Schaer DJ, Buehler PW, D'Agnillo F.
Extracellular Hb enhances cardiac toxicity in endotoxemic guinea pigs: protective role of haptoglobin. Toxins (Basel). 2014 Mar 31;6(4):1244-59. Mouse anti Human CD163 antibody, clone EDHu-1 (MCA1853) used for the evaluation of macrophage infiltration in the brains of SIV infected Rhesus macaques by immunofluorescence on formalin fixed, paraffin embedded tissue sections. Massive activation and productive infection of microglia in CD4-depleted RMs. (a) ISH showing the levels of SIV vRNA+ cells in brain from a representative SIV-uninfected control (top), SIV-infected control (middle) and CD4-depleted SIV-infected (bottom) animal. The amount of SIV vRNA+ cells was markedly higher in CD4-depleted animals than in controls. (b) Immunofluorescence staining for CD163 (left panels), HLA-DR (middle panels) and proliferating cell nuclear antigen (PCNA; right panels) in the parenchyma of one representative SIV-uninfected control (top), one SIV-infected control (middle) and one SIV-infected CD4-depleted (bottom) RM. Nuclei are stained in green; markers of interest in red. (c) Quantitative analyses showing the number of cells per mm2 of tissue that stained positively for the markers of interest. Increased expression of CD163, HLA-DR and PCNA was found in CD4-depleted animals (orange square; n = 4) when compared to both groups of controls (SIV- open circle, n = 3; SIV+ closed circle, n = 3). (d) Single and combined staining for IBA-1 (green), CD163 (blue), and SIV-vRNA (red) in the brain of one representative SIV-infected CD4 depleted RM. The box on the right is a magnification of a microglial cell (IBA-1+) that expresses CD163 and is productively infected (SIV vRNA+). 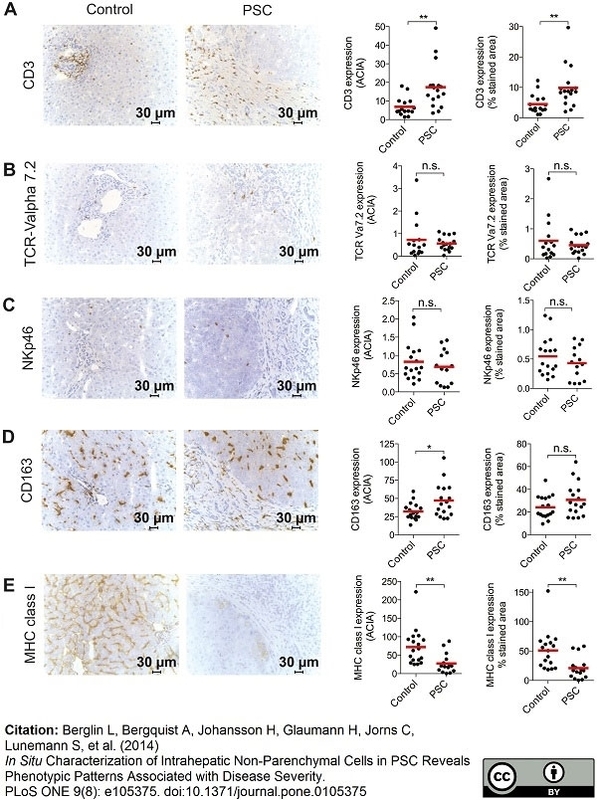 CD4 Depletion in SIV-Infected Macaques Results in Macrophage and Microglia Infection with Rapid Turnover of Infected Cells. Mouse anti Human CD163 antibody, clone EDHu-1 (MCA1853) used for the identification of intestinal and lymph node macrophages in SIV infected macaques by immunofluorescence on formalin fixed, paraffin embedded tissue sections. Massive SIV infection of LN and intestinal macrophages in CD4-depleted RMs. (a) Immunofluorescence staining for T cell (CD3; blue) and macrophage (CD68 and/or CD163; green) lineage markers combined with in situ hybridization for SIV vRNA (red) in the LN isolated at day 42 post-infection from one representative undepleted control (left) and one CD4-depleted RM. The vast majority of SIV vRNA+ cells express CD3 in undepleted control but express CD68/CD163 in CD4-depleted RM. 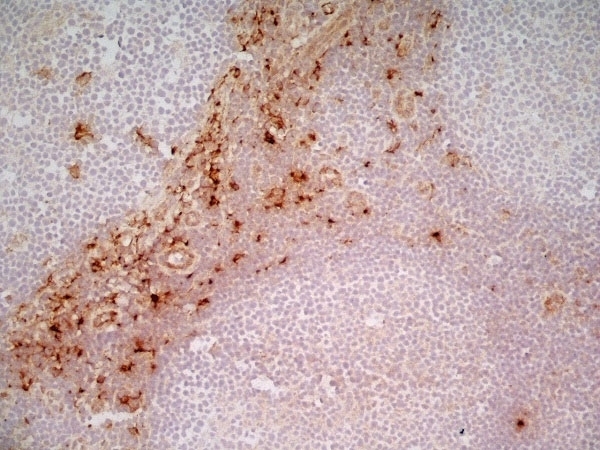 (b) The same staining is shown for colon (top) and jejunum (bottom) tissues in two representative CD4-depleted animals. (c) Quantitative image analysis of LN and mucosal tissues showing the fraction of SIV vRNA+ cells that express CD3 or CD68/CD163 in CD4-depleted (n = 12; the 8 animals in this study plus the 4 in Ortiz et al 2011) or undepleted control RMs (n = 6; two SIVmac251 infected animals belonging to a different study were added as controls). (d) Relative abundance of SIV vRNA+ in productively infected T cells and macrophages, determined by measuring the volumetric sum of the SIV vRNA+ intensity integration values in situ from confocal images collected under identical laser settings, is shown in four CD4-depleted RMs. Macrophages on average have higher per cell SIV vRNA+ content compared to CD4+ T cells within the same host. Statistical analyses were determined by Mann-Whitney test. Mouse anti Human CD163 antibody, clone EDHu-1 (MCA1853) used for the detection of CD163 expressing cells in vitro by immunofluorescence. Expression of Mf-markers and NF-κB subunits in co-cultures of HSC-3 cells and M1 or R848 Mfs. Vybrant CM-Dil labeled HSC-3 cells (red) and unlabeled M1- or R848 Mfs were incubated with DMSO or 10 ng/ml TNF-α for 30 min where after cells were fixed for immunofluorescence with antibodies for CD68, CD163, NF-κB p50 and p65 subunits. Some samples were pre-incubated with 10 μM BAY 11-7082 prior to TNF-α activation. AlexaFluor488-conjugated secondary antibody was used for visualization. Samples were mounted with DAPI- mountain medium to visualize nuclei (blue). Samples were photographed with a Leica Confocal microscope with 63x oil immersion objective. CD163 and NF-κB p65 immunofluorescence from HSC-3 cell and M1 Mf co-cultures (A). CD68 and NF-κB p50 immunofluorescence from HSC-3 cell and R848 Mf co-cultures (B). Red arrows indicate HSC-3 cells and green arrows Mfs. Scale bars 50 μm. 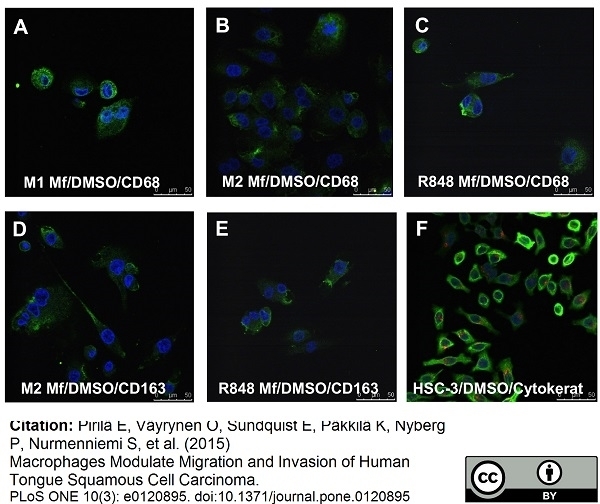 Macrophages Modulate Migration and Invasion of Human Tongue Squamous Cell Carcinoma. Mouse anti Human CD163 antibody, clone EDHu-1 (MCA1853) used for the detection of CD163 expressing cells in human tongue carcinoma by immunohistochemistry on formalin fixed, paraffin embedded tissue sections. TAMs localize to evading carcinoma cells in vivo. 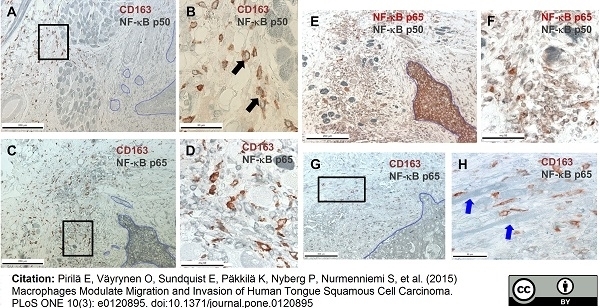 Human tongue carcinoma tissue sections were subjected to double-staining immunohistochemistry with antibodies for CD163, NF-κB p50 and NF-κB p65. CD163 (red) and NF-κB p50 (grey) staining in A, B. Black arrows show cells with both red and grey color, indicating co-localization of the antibodies. 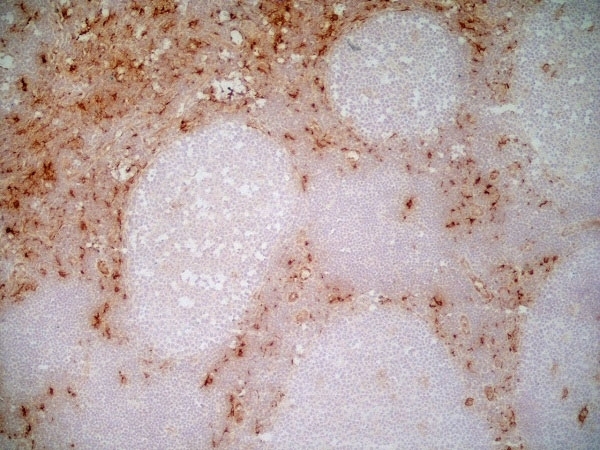 CD163 (red) and NF-κB p65 (grey) staining in C,D, G,H. Blue arrows in H show tongue carcinoma cells. NF-κB p50 (grey) and NF-κB p65 (red) staining in E,F. Black boxes in A, C and G indicates site of magnification in B, D and H respectively. Scale bars in A,C,E and G 200 μm and in B, D, F, and H 50 μm. Vybrant CM-Dil labeled HSC-3 cells (red) and unlabeled M1-, M2 and R848 Mfs were incubated with DMSO where after cells were fixed for immunofluorescence with antibodies for CD68, CD163 and pancytokeratin. AlexaFluor488-conjugated secondary antibody was used for visualization. Samples were mounted with DAPI- mounting medium to visualize nuclei (blue). Samples were photographed with a Leica Confocal microscope with 63x oil immersion objective. CD68 marker staining in DMSO-treated M1 Mfs (A), M2 Mfs (B) and R848 Mfs (C). CD163 marker staining in DMSO-treated M2 Mfs treated (D) and R848 Mfs (E). DMSO-treated HSC-3 cells (red) stained with pancytokeratin (green) in F. Scale bars 50 μm. Mouse anti Human CD163 antibody, clone EDHu-1 (MCA1853) used for the identification and enumeration of infiltrating macrophages in both polyploid and non-polyploid colorectal adenoma tissue sections by immunohistochemistry on formalin fixed, paraffin embedded tissue sections. 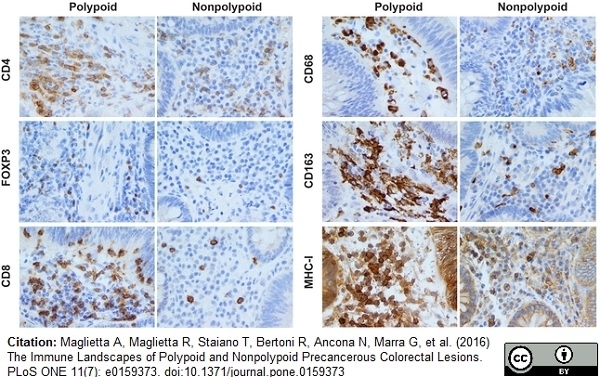 Immunohistochemical assessment of stromal immune cell infiltrates in polypoid and nonpolypoid colorectal adenomas. CD4+, FOXP3+, CD8+, CD68+, CD163+, and MHC-I+ immune cell densities (i.e., number of positively-stained cells per unit area; see Methods) in the stroma of polypoid adenomas were consistently higher than those observed in nonpolypoid lesions. Intraepithelial CD8+ (cytotoxic) T cells are also seen in the epithelial compartments of both types of tumor. In calculating CD68+ and CD163+ macrophage densities, we counted only nuclei surrounded by CD68+ or CD163+ granulations and excluded elongated or fragmented cells with granular cytoplasmic positivity. MHC-I labelling (granular, compact, or membranous) was observed in a variety of stromal cells. MHC-I+ epithelial cells were also present in both types of tumor, but their presence was not quantified in this study. Magnification for all panels: 400X. The Immune Landscapes of Polypoid and Nonpolypoid Precancerous Colorectal Lesions. Mouse anti Human CD163 antibody clone EDHu-1 (MCA1853) used for the identification of skin macrophages by immunohistochemistry. 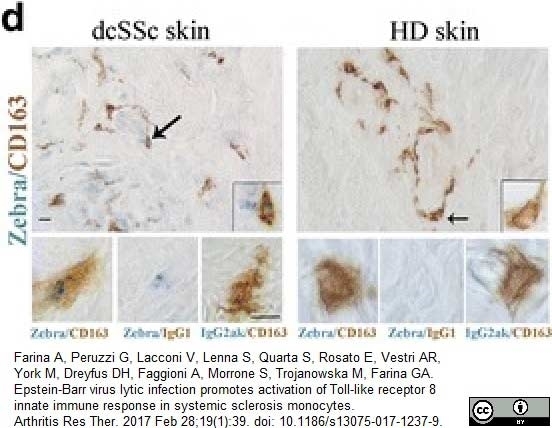 From: Farina A, Peruzzi G, Lacconi V, Lenna S, Quarta S, Rosato E, Vestri AR, York M, Dreyfus DH, Faggioni A, Morrone S, Trojanowska M, Farina GA.
Epstein-Barr virus lytic infection promotes activation of Toll-like receptor 8 innate immune response in systemic sclerosis monocytes. Arthritis Res Ther. 2017 Feb 28;19(1):39. Mouse anti Human CD163 antibody, clone EDHu-1 recognizes the human CD163 cell surface antigen, a 130-140 kDa glycoprotein expressed by tissue macrophages. CD163 is not expressed by resting peripheral blood leucocytes but expression may be induced on monocytes by culture in dexamethasone. Clone EDHu-1 is reported to inhibit the binding of haptoglobin/hemoglobin to CD163 (Madsen et al. 2004).Truncation mutation analysis demonstrates binding of EDHu-1 occurs via the N-terminal region of CD163 containing the first three scavenger receptor, Cysteine-rich, SRCR domains the third domain being critical as, cleavage of this domain at the major cleavage site ASP-265 abrogates binding to the N-terminal fragment. Store at +4oC or at -20oC if preferred. This product should be stored undiluted. Storage in frost free freezers is not recommended. This product is photosensitive and should be protected from light. Avoid repeated freezing and thawing as this may denature the antibody. Should this product contain a precipitate we recommend microcentrifugation before use. Kristiansen, M. et al. (2001) Identification of the haemoglobin scavenger receptor. Madsen, M. et al. (2004) Molecular characterization of the haptoglobin.hemoglobin receptor CD163. Ligand binding properties of the scavenger receptor cysteine-rich domain region. J Biol Chem. 279 (49): 51561-7. Kim, W.K. et al. (2006) CD163 identifies perivascular macrophages in normal and viral encephalitic brains and potential precursors to perivascular macrophages in blood. Am J Pathol. 168 (3): 822-34. Moreno JA et al. (2010) Peripheral artery disease is associated with a high CD163/TWEAK plasma ratio. Arterioscler Thromb Vasc Biol. 30 (6): 1253-62. Herrmann-Hoesing, L.M. (2010) Ovine progressive pneumonia virus capsid antigen as found in CD163- and CD172a-positive alveolar macrophages of persistently infected sheep. Asleh, R. et al. (2003) Genetically determined heterogeneity in hemoglobin scavenging and susceptibility to diabetic cardiovascular disease. Fabriek, B.O. et al. (2007) The macrophage CD163 surface glycoprotein is an erythroblast adhesion receptor. Jensen, T.O. et al. (2009) Macrophage markers in serum and tumor have prognostic impact in American Joint Committee on Cancer stage I/II melanoma. J Clin Oncol. 27: 3330-7. Montes de Oca, M. et al. (2005) Skeletal muscle inflammation and nitric oxide in patients with COPD. Eur Respir J. 26: 390-7. Martens JH et al. (2006) Differential expression of a gene signature for scavenger/lectin receptors by endothelial cells and macrophages in human lymph node sinuses, the primary sites of regional metastasis. J Pathol. 208 (4): 574-89. Vinet-Oliphant, H. et al. (2010) Neurokinin-1 receptor (NK1-R) expression in the brains of SIV-infected rhesus macaques: implications for substance P in NK1-R immune cell trafficking into the CNS. Am J Pathol. 177: 1286-97. Wang, X. et al. (2006) Monocyte/macrophage and T-cell infiltrates in peritoneum of patients with ovarian cancer or benign pelvic disease. J Transl Med. 4: 30. Grund, S. et al (2009) The microglial/macrophagic response at the tumour-brain border of invasive meningiomas. Neuropathol Appl Neurobiol. 35: 82-8. Jorgensen, J.M. et al (2009) Expression level, tissue distribution pattern, and prognostic impact of vascular endothelial growth factors VEGF and VEGF-C and their receptors Flt-1, KDR, and Flt-4 in different subtypes of non-Hodgkin lymphomas. Moreno, J.A. et al. (2009) The CD163-expressing macrophages recognize and internalize TWEAK: potential consequences in atherosclerosis. Tang, Z. et al. (2013) Glucocorticoids Enhance CD163 Expression in Placental Hofbauer Cells. Boyle, J.J. et al. (2009) Coronary intraplaque hemorrhage evokes a novel atheroprotective macrophage phenotype. Am J Pathol. 174: 1097-108. Taus, N.S. et al. (2010) Sheep (Ovis aries) airway epithelial cells support ovine herpesvirus 2 lytic replication in vivo. Berglin, L. et al. (2014) In situ characterization of intrahepatic non-parenchymal cells in PSC reveals phenotypic patterns associated with disease severity. Liu, J. et al. (2014) Evidence for mTOR pathway activation in a spectrum of epilepsy-associated pathologies. Acta Neuropathol Commun. 2: 71. Baek, J.H. et al. (2014) Extracellular Hb enhances cardiac toxicity in endotoxemic guinea pigs: protective role of haptoglobin. Micci, L, et al. (2014) CD4 depletion in SIV-infected macaques results in macrophage and microglia infection with rapid turnover of infected cells. Pirilä E et al. (2015) Macrophages modulate migration and invasion of human tongue squamous cell carcinoma. PLoS One 10 (3): e0120895. Lakritz, J R. et al. (2016) α4-Integrin Antibody Treatment Blocks Monocyte/Macrophage Traffic to, Vascular Cell Adhesion Molecule-1 Expression in, and Pathology of the Dorsal Root Ganglia in an SIV Macaque Model of HIV-Peripheral Neuropathy. Fry, L.M. et al. (2016) East Coast Fever Caused by Theileria parva Is Characterized by Macrophage Activation Associated with Vasculitis and Respiratory Failure. PLoS One 11 (5): e0156004. Schultz, N. et al. (2016) Amylin alters human brain pericyte viability and NG2 expression. Zhang, W. et al. (2013) Myeloid clusters are associated with a pro-metastatic environment and poor prognosis in smoking-related early stage non-small cell lung cancer. Furukawa S et al. (2017) Interleukin-33 produced by M2 macrophages and other immune cells contributes to Th2 immune reaction of IgG4-related disease. Farina, A. et al. (2017) Epstein-Barr virus lytic infection promotes activation of Toll-like receptor 8 innate immune response in systemic sclerosis monocytes. Arthritis Res Ther. 19 (1): 39. Mallard, J. et al. (2017) A method for obtaining simian immunodeficiency virus RNA sequences from laser capture microdissected and immune captured CD68+ and CD163+ macrophages from frozen tissue sections of bone marrow and brain. Blair, T.C. et al. (2016) Immunopathology of Japanese macaque encephalomyelitis is similar to multiple sclerosis. Zhu, C. et al. (2017) Activation of CECR1 in M2-like TAMs promotes paracrine stimulation-mediated glial tumor progression. Derricott, H. et al. (2016) Characterizing Villitis of Unknown Etiology and Inflammation in Stillbirth. Am J Pathol. 186 (4): 952-61. Wächter, C. et al. (2016) Loss of cerebellar neurons in the progression of lentiviral disease: effects of CNS-permeant antiretroviral therapy. J Neuroinflammation. 13 (1): 272. Chen, J. et al. (2019) Generation of Pigs Resistant to Highly Pathogenic-Porcine Reproductive and Respiratory Syndrome Virus through Gene Editing of CD163. Int J Biol Sci. 15 (2): 481-492.